Hello friends! Thought I'd take a few minutes to upload pictures of a recent card workshop I did. The cutting for the pattern paper is EASY - it uses exactly one sheet of 12x12 pattern paper. You can use any paper you'd like and any stamping sentiments...the fun part is the embellishing. 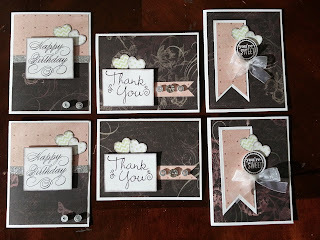 In these cards I used silver shimmer trim (love this...it's like using ribbon, but it's sticky on the back! ), blinged-out buttons, and my favorite ribbon...organza!